Everybody needs somebody. We see it played out around us, and Scripture even teaches us this powerful truth in Genesis 2. We see it played out again in Acts 2 as the early church cultivated fellowship with one another as they gathered together. 2000 years may have passed, but things haven't really changed. We need God, and we need each other. 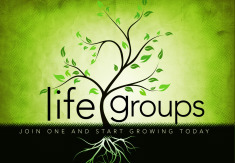 That's where Life Groups come into the picture. At ZBC we want to create environments where those authentic, redemptive relationships can happen, both with God and with one another. At Zebulon we offer campus-based Life Groups every Sunday at 9:45am, but we also offer home-based Life Groups that meet at different times according to the needs of the group. As we gather together we want to spur one another on toward greater faith and ministry as we study and discuss God's word, pray for one another, and minister to one another and with one another. If you'd like to be a part of a home-based Life Group for the 2016-2017 school year, please click the link below to let us know.